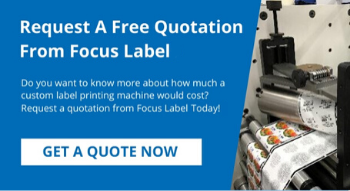 Focus Labels has been in the business of designing, manufacturing and assembling bespoke label printing machines since 1981. Our 35 years’ business experience working with companies around the world in many different market sectors gives us exceptional insight into the needs of the label printing industry. Over the years we have experienced and overcome most of the operational and design issues facing print equipment - and have successfully applied changing print technologies to the challenges facing an evolving industry. In addition to our work as manufacturers, we offer design consultancy services, giving customers the benefit of our expertise and specialist technical knowledge. Upgrading, modifying or reorganising your label printing can save you significant expense and increase the productivity of your operation. Through our bespoke design solutions, our customers have experienced a reduction in returns, less wastage and greater time efficiency, leading to an overall higher ROI from label printing. Critically, at a time when print equipment and methods are changing at a phenomenal speed due to new imprinting methods and digital technologies, our design services help you retain your market lead in face of rising competition. New and exciting options are now available to label printers that were unheard of even a few years ago. Labels can now be printed on a wider range of materials, in shorter time and using less ink than previously. If your operation has not seen significant investment or change for a while, there is a danger you may be slipping behind your competitors in terms of efficiency and productivity. Our Focus Labels design consultants can help you identify parts of your workflow that can be adjusted and overhauled to improve the profitability of your business. There are many different choices available to you and we can discuss the best option for you on a one-to-one basis. It may be that we can revolutionise your operation by designing a bespoke label printing machine that is fine tuned to the needs of your business. Or, we may be able to retrofit older equipment to accommodate new technologies. All these possibilities are within your reach. To speak to one of our consultants or to schedule a free, no obligation discussion, please get in touch through the contact form on this webpage. For an up-to-date product brochure, featuring all our latest equipment, simply send us your name, email address and specify which equipment you would like further information about through our contact form and we will send you a download link. For ongoing consultancy work or to talk about a bespoke project, send us a short message and one of our advisers will get in touch to arrange a meeting with our technical team. If you’re unfamiliar with Focus Label machinery and would like to see our equipment in action, we can arrange an exclusive demonstration in our dedicated showroom facility. Also our products are frequently featured at some of the worlds major print technology expos. Please refer to our blog to read about our recent exhibits and upcoming demonstrations. Contact our team through the form on this page and one of our advisers will be in touch to arrange a convenient time. Send us your requirements or an initial enquiry to find out how much your machine would cost to design, manufacture and install.